The rich flavor of truffles pairs with sugar and rosemary in this decadent snack mix. Rosemary Truffle Popcorn with Nuts made with truffle sea salt flavored The Little Kernel popcorn is irresistible! I am almost positive I’ve talked about popcorn. And how there’s always room for popcorn in this garlasiago popcorn post. That was – IS my motto. It was the saying we used when growing up, too. We were – ARE a popcorn loving family. It was a no brainer when The Little Kernel reached out to me to taste some of their delicious popcorn. And it is just that; DELICIOUS! And since I’m a self-proclaimed popcorn snob, that’s something I do not say lightly. The Little Kernel boasts a smaller popcorn kernel. It’s a hull-less kernel that is super crunchy and perfectly delicious. With flavors like naked, truffle sea salt, sweet and salty kettle, pink Himalayan salt, butter, and white cheddar you can’t go wrong with this delicious snack. They cook their popcorn in 100% pure olive oil. Their popcorn is also non-GMO, gluten-free, and dairy-free. That last one is interesting with the introduction of the white cheddar, but I don’t think they claim the white cheddar is dairy-fee. Either way, their popcorn is delicious! Now, everyone else that did a post about this company shared the same recipe. I, on the other hand, wanted to give this little popcorn company the recognition it deserves! 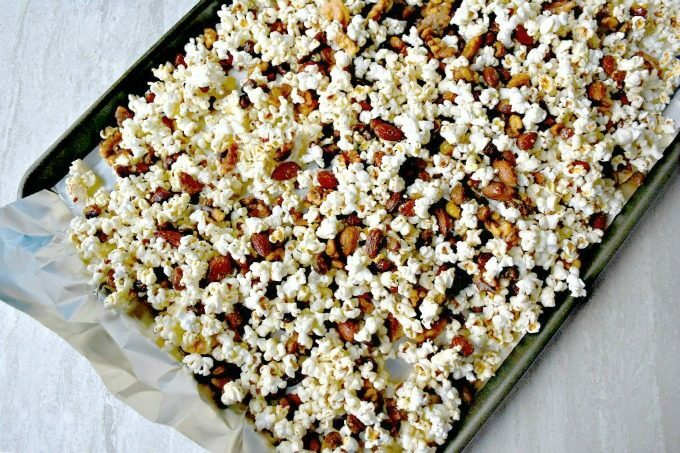 I created a recipe with their truffle sea salt popcorn. And let me tell you, it is SOOOOOO good! I gave some out to a few on the train and they devoured it on the spot. It’s a great afternoon pick me up snack that just decadent enough to hopefully get you through the rest of your work day. Now, I have to admit I haven’t had a lot of exposure or experience with truffle anything. I’ve never bought the oil or truffles themselves. I’ve had those potato chip and some French fries. That’s about it. So, I can only speak to my experience (or lack thereof) with truffle flavor, but it’s AH-mazing! There’s an earthy deliciousness to the truffle flavor. So, of course I had to lighten that up a little bit with a buttery sugar coating and some roasted almonds. The toasted almonds complement the earthy truffle flavor while the buttery sugar coating makes it a deliciously sweet snack to bring everything together. Finally, there’s the punch of flavor from the rosemary infused in the syrup. This could easily be kept in clusters. OR you could break it up and snack on it that way. There’s no better way to eat this rosemary truffle popcorn with nuts. Just eat it. It’s packed with amazing flavor that will easily get you over that mid-afternoon hump at work. We’ve all been there. It’s that slump where you want to just crawl under your desk and take a nap. It’s packed with healthy fiber and energy packed protein. And, well, there’s that earthy and delicious truffle flavor. Oh yeah, baby. And it’s PACKED with truffle flavor thanks to The Little Kernel popcorn. And those little kernels are the perfect snack size! As if that wasn’t enough, The Little Kernel popcorn has no hull. So, that means no little bits of annoying hull that is stuck in your teeth for the rest of the afternoon. I swear one of these days I will take dental floss to work. Do you keep dental floss at work? Is that a thing? Anyway, with these little kernels, you won’t have to worry about needing dental floss at work. What you will have to worry about is which of their delicious flavors you’re going to take to work to snack on AFTER you make this trufflicious recipe of mine! What’s your favorite popcorn flavor? Be sure to follow the on Facebook, Twitter, and Instagram to see what they’re up to and what flavors they come out with. Line two baking sheets with aluminum foil coated with cooking spray. Set aside. Combine sugar, water, and butter in a skillet. Heat over medium heat until melted. Add the rosemary and continue to cook, stirring frequently, until the temperature reaches 235 to 240 F.
While the sugar is cooking, combine the nuts and popcorn in a large, heat safe bowl. Once the sugar mixture reaches 235, cool slightly before pouring over the popcorn and nut mixture. Stir until the sugar mixture coats the nuts and popcorn. Spread out onto the baking sheets and bake at 400 for 10 to 15 minutes or until the nuts are roasted. Cool in pan before breaking into chunks and serving. Store in an airtight container for up to 2 weeks.